Before having children, a lot of people look around at other families with kids (maybe even slyly smiling to themselves) and mistakenly assume they are going to do better. We are going to have total control of our kids, is what many of us think BK (before kids). We would never let our kid act that way. Or, our kids are never going to do/say something like that. Hey parents, how many of you thought this way before having children? How many still feel this way? Exactly. We've all had our share of humble pie and hopefully have learned not to judge others through it. There is no more humbling experience, day in and day out, than parenting. Praise God for helping us keep our eyes on Him! Just this morning, I sent Larry upstairs to brush his teeth. A simple task that lately has been causing volcanic eruptions in our home. I heard him run into the bathroom and thought, "Wow, he is getting himself ready...quietly even! We are making progress." Then, he emerged ten minutes later. 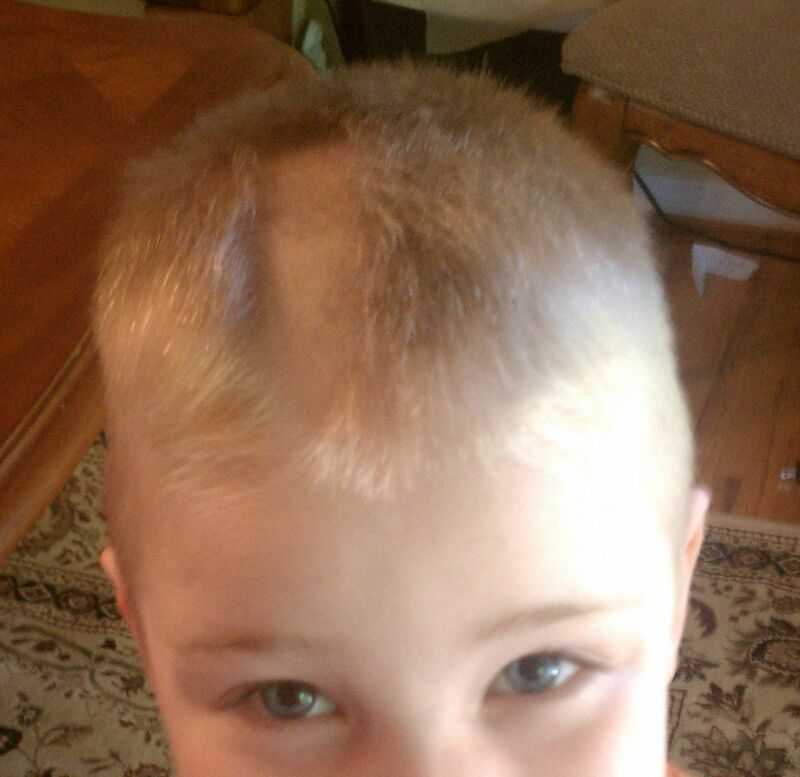 A bald track in his head the width of daddy's beard trimmer. Smiling and proud he exclaimed, "I didn't touch the razor, mommy. I used the trimmers." Well, at least safety was a consideration. (If you're angry and you know it, take deep breaths. This is becoming my mama mantra.) Now, back the task at hand. His teeth? You guessed it...not brushed. So, it should come as no surprise that parenting adopted children is equally humbling. Yesterday an adoptive friend made a statement that rang true. Adoptive parents are often hesitant to share the difficult parts of the adoption experience, especially when it comes to discipline and household stress related to the adoption. My guess (and it's just a guess) is that we don't want to be perceived as failures. In addition, we do not want to scare anyone away from considering adoption. With that being said, here are two great truths in our home surrounding our adoption. First and foremost, we would do it again in a heartbeat...and actually plan to, once we reach cruising altitude. We will embrace (and brace ourselves for) every joy, challenge, struggle, and sleepless night. There has been nothing about this experience that would stop us from stepping out in faith again. Remember, God is the strength in our weakness. Essentially, all we are doing is telling God he can use us and our bodies. He does the rest. We have done none of this on our own. (Philippians 2:13) Second, the past three and a half months have been the hardest we have ever been through. Here is the mathematical expression: take the emotional nature of the experience, coupled with everyone's world being turned upside down, in addition to living in a home with three (very intense) children four years of age and younger, add an eleven year old who is just learning English and is not used to discipline being enforced, multiply the noise level by four, and throw in two parents learning how to parent a pre-adolescent . What do you get? A whole lot of question marks and the need to seek Christ minute by minute. The past few months have been hard on our marriage. We have argued like never before. We have been so exhausted that we could not even reconcile before going to sleep. We have disagreed in front of the children. We have had to come up with new and (hopefully) effective discipline measures on the fly. We have had to remain calm and collected beyond our physical abilities. I have been angry. I have been resentful. I have grieved the loss of our old family unit. The past few months have also been hard on our children. Three children four years of age and younger need a lot of individual attention. I am only one person, yet each of their mothers. They each want my help, attention, praise, and affirmation...usually at the same time. Our eleven year old needs attention too. His activities are separate from the preschoolers. He wants praise and affirmation and also the recognition that he is the oldest child. He wants to do things his way and does not like rules enforced. The daily business of life has been hard, very hard. Most importantly though, we pray together daily as a family and know that day-by-day we are growing together, in Christ. Our foundation is in Christ and He does not fail. Because our foundation is strong, everything else is 'just a thang'! Looking back, it is easy to see how far we have come and how much we have grown. In three short months we have all made exponential progress, but it has not been easy. Every challenge is an opportunity for growth and thankfully, God gives us many do-overs. If we do not get it right the first time, there is always to the opportunity to take a new approach the next time. Like the title of John Ortberg's book, If You Want To Walk On Water, You've Got To Get Out Of The Boat, we know that in order to live our lives to the fullest and become more like Christ, we have to take risks. We knew that adding another toddler plus an eleven year old boy to our family would be assuming some risk. With those risks, may come stumbling and heartache, but also great reward. The past few months have been a dance. An awkward, sometimes monotonous, gaggle of a dance...similar to what I witnessed while stationed in Germany when everyone at a night club did the electric slide all night long to each and every song that played with a few outliers doing there own thing here and there. Gaggle, monotonous, uncoordinated dancers doing our best to grow in Christ. That about sums up our family at the present moment. I often wonder why God waits until we are at our wit's end before intervening. But then I laugh. I know He is not the one waiting. Instead it is me not listening. He is there all along trying to gently guide and direct my path; however, I probably do not fully acknowledge Him until I am at my wit's end. Psalm 32:8 says, "I will instruct you and teach you in the way you should go; I will counsel you and watch over you." I read it; I say that I believe it; yet, for those things I consider too small for God (the daily business of life), I tend to rely on myself until I am about to break. I envision a life of fully trusting God in the big and small details and continue to pray that He takes me there. So, there you have it...along with the glorious and magnificent is also the difficult and ugly. Some days are downright U-G-L-Y. Luckily, we have God's promise in Isaiah 58:11, "The Lord will guide you always; He will satisfy your need in a sun-scorched land and will strengthen your frame. You will be like a well watered garden, like a spring whose waters never fail." I don't know about you, but when I read those words, I can feel and taste the refreshment. That is our living God!